Rarely does an automaker so comprehensively resurrect a model as GM has done with the 2016 Chevrolet Malibu. Reworked from nose to tail, the new Malibu offers a choice of turbocharged 4-cylinder engines, sleek styling, a roomy interior, modern technology and a competitive price. It's enough to make you forget last year's awkward too-small Malibu.and that's the point. Very bad blind spots - you really have to use your mirrors and LOOK around when changing lanes because the cars are not obvious when driving. I always look to see if there's a car in the other lane because they don't often show in the mirror until it is too late. I don't like the Malibu's blind spots. They seem more obvious in this car than any other car I've had. I also do not like their tire quality in the sense that I've had to replace all 4 tires in the first year & 1/2, which is ridiculous. 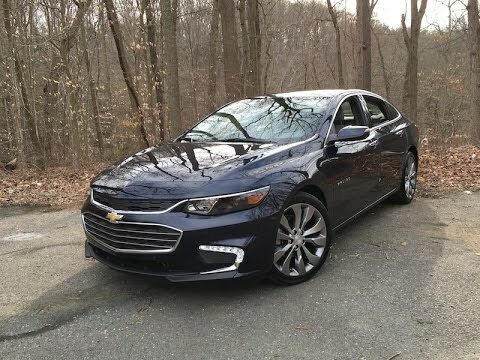 I've read reviews on how others are also disappointed with the Malibu tires. Additionally, there have been various minor problems in the 2 years I've owned this car and it's been in the shop about 10 different times, which is really a hassle when you buy a NEW CAR to avoid this. I would have rated the car lower due to all of the issues I have had with it, but it does have a clean, smooth ride overall. I've gotten several compliments on how nice the car drives and rides, as well as how roomy it is. I love that you can connect your phone through bluetooth! And the screen lifts up for a secret compartment! This car is very new to us, but we are absolutely loving it! I love the backup camera and the sunroof (never had that before)! It does seem a little smaller than the older model we used to drive but not by much. It runs smoothly and we haven't had any issues so far. The only things that bother me is the Auto Stop when the engine shuts off like for example, you are stopped at a red light. I know it is to be more environmentally friendly, but it just disrupts me every time it shuts off. I also am not a big fan of the automated buttons to adjust the driver's seat. It takes too long for me and I would prefer just pulling a lever to make it go quicker. These are all minor things. I am really enjoying my experience so far! Overall dependable despite the minor hiccups. My 2016 Malibu is very reliable! I love have not have any mechanical issues. It is really good on gas mileage. It drives very smoothly! I love the apple carplay features in the car. Although sometimes the computer sticks ever so often, but after taking the car to the dealership they were able to fix it. The premium tires on the car is pretty pricey but having a car will always cost you. During the winter time be careful with the sunroof if you have it because precipitation can freeze and expand which may lead to some leaking but the dealership was able to fix that as well. I would just suggest you looking at the sunroof on the days where the snow is really bad. Overall I love my car and do not regret this purchase. General Motors LLC (GM) is recalling certain model year 2016 Chevrolet Malibu vehicles manufactured November 18, 2015, to June 7, 2016. The fabric of the side-impact air bag cushion may tear during deployment. If the air bag tears during deployment, the air bag may not perform as designed, increasing the risk of injury in the event of a crash. GM will notify owners, and dealers will inspect and, as necessary, replace the air bag module, free of charge. The recall began October 27, 2016. Owners may contact Chevrolet customer service at 1-800-222-1020. GM's number for this recall is 16079. Genera Motors LLC (GM) is recalling certain model year 2016 Chevrolet Camaro, Malibu, Silverado and GMC Sierra vehicles. The radio may intermittently fail to provide an audio warning when the key has been left in the ignition and the door is opened or when the driver does not fasten their seat belt. As such, these vehicles fail to comply with the requirements of Federal Motor Vehicle Safety Standards (FMVSS) number 114, "Theft Protection", and/or 208, "Occupant Crash Protection." An unbelted driver is at a greater risk of injury in a crash. GM will notify owners, and dealers will update the radio software, free of charge. The recall began on March 14, 2016. Owners may contact Chevrolet customer service at 1-800-222-1020, or GMC customer service at 1-800-462-8782. GM's number for this recall is 15808. General Motors LLC (GM) is recalling certain 2016-2018 Chevrolet Malibu vehicles. During servicing, a Passenger Presence System (PPS) may have been installed that was not correctly calibrated to the vehicle's seat type. As a result, the PPS may not properly identify an adult passenger from a child passenger in the front passenger seat, potentially causing the air bag to not deploy when it should, or causing the air bag to deploy when it shouldn't. In the event of a crash, improper air bag deployment can increase the risk of injury. GM will notify owners, and dealers will replace the front passenger PPS seat service kit, free of charge. The manufacturer has not yet provided a notification schedule. Owners may contact Chevrolet customer service at 1-800-222-1020. GM's number for this recall is 18208. General Motors LLC (GM) is recalling certain model year 2016 Chevrolet Colorado vehicles manufactured January 19, 2016, to February 2, 2016, Chevrolet Malibu vehicles manufactured January 9, 2016, to January 26, 2016, and 2016 GMC Canyon vehicles manufactured January 21, 2016, to February 4, 2016. The driver frontal air bag may improperly inflate during second-stage deployment in the event of a high speed crash. An improperly inflated air bag increases the risk of injury. GM will notify owners, and dealers will replace the driver side frontal air bag module, free of charge. The recall began on April 14, 2016. Owners may contact Chevrolet customer service at 1-800-222-1020, and GMC customer service at 1-800-462-8782. GM's number for this recall is 28030. General Motors LLC (GM) is recalling certain model year 2016 Chevrolet Malibu vehicles manufactured March 7, 2016, through March 12, 2016. The memory chip in the electronic brake control module (EBCM) may fail and cause the loss of electronically controlled brake systems including anti-lock brakes (ABS) and electronic stability control (ESC). As such, these vehicles fail to conform to Federal Motor Vehicle Safety Standard (FMVSS) number 126, "Electronic Stability Control Systems." If the EBCM fails the primary braking system will still function, however, the loss of ABS and ESC increase the risk of a crash. GM will notify owners, and dealers will install a replacement EBCM, free of charge. The recall is expected to begin on June 10, 2016. Owners may contact Chevrolet customer service at 1-800-222-1020). GM's number for this recall is 39440. General Motors LLC (GM) is recalling certain 2016 Malibu vehicles manufactured February 16, 2016, to March 5, 2016. The two weld studs that mount the front and rear side impact air bags may fracture and separate from the air bag during deployment. As such, these vehicles fail to comply with the requirements of the Federal Motor Vehicle Safety Standard (FMVSS) No. 214, "Side Impact Protection." Fractured weld studs may allow the side air bag to move out of position during deployment, increasing the risk of injury. GM will notify owners, and dealers will replace the side air bag modules, free of charge. The recall began on April 14, 2016. Owners may contact Chevrolet customer service at 1-800-222-1020. GM's number for this recall is 31820.